What If You Can’t Afford an SR22? What If You Can’t Afford an SR22? When a driver has been convicted of a range of traffic offences, their Driver’s License may be suspended. Once the period of suspension has been lifted, the license can be re-validated. However, in most states, authorities insist that the driver carries a special certification known in most states as an SR22. An SR22 is vehicle liability insurance required by most state DMV offices for high-risk policies. When drivers who have been convicted of DUI (or similar charges such as DWI, DWAI or Wet Reckless) have their license reinstated; the law requires them to carry and SR22 while driving. Other offences that may lead to the need for an SR22 include reckless driving, being at fault in an accident, multiple traffic offenses, and in fact most suspensions related to a traffic violation. An SR22 is required for three years after a license has been suspended. Some states have requirements for additional license validation, such as an FR44 in Florida, an SR50 in Indiana, or an SR22A in Georgia, Mississippi and Texas. In general, these forms specifically relate to individuals who have been convicted of DUI, and show proof that the driver is carrying adequate insurances for Bodily Injury Liability (BIL) and Property Damage Liability (PDL). When an individual has been convicted and is having their license reinstated, they must obtain an SR22 before driving. 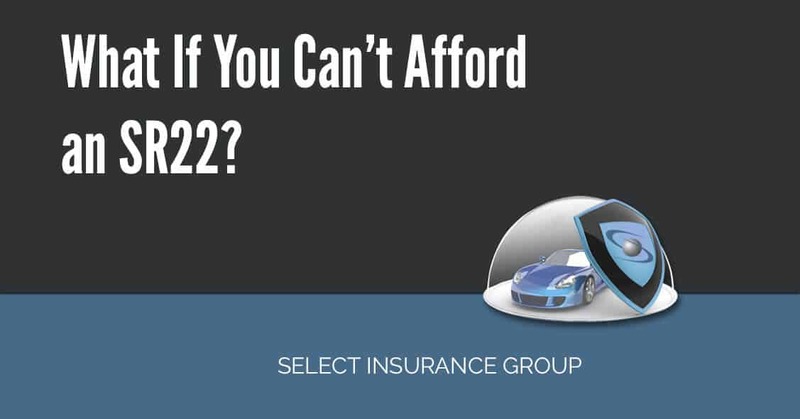 Select Insurance Group provides affordable SR22 insurance solutions for less then $1/day. Many drivers will simply consider re-establishing their insurance with their existing provider, presuming the existing insurance company will provide cover, which may not always be the case. Irrespective of which company a driver chooses, the cost of the insurance will be significantly higher than it would have been before the conviction. We are focus on financial responsibility certificates for high-risk drivers. We shop over 15 different companies, to provide reasonable rates on SR22. If for whatever reason, SR22 lapses, insurance provider will inform the DMV, and then license will be suspended or revoked. It is necessary to renew the coverage. The insurance provider will have to complete another SR22 filing with the DMV office, there will be another license reinstatement fee, and the period of the SR22 will re-start, meaning the driver will be required to carry an SR22 for the next three years. What if You Unable Pay For SR22? Individuals who require an SR22 will have already had considerable expense associated with their convictions. These costs will have included fines, legal fees, and a range of other costs. The cost of additional insurance can be a significant impediment. People may be very concerned about how to manage their situation if they simply can’t afford the SR22. The first point to note is that the SR22 is essential. Driving without the insurance may carry a sentence of up to 364 days in jail. For many people, driving is essential for activities as simple as getting to work (and keeping their jobs). With the requirement for an SR22, the person can legally drive, but the cost of complying with the requirement may be prohibitive. Individuals who want to drive, and need an SR22 are limited to their choices. The first thing that each person needs to remember is that an SR22 is not permanent. The additional cost of insurance will in general only be in place for three years. Alternative travel options may work for some. These include buses and trains, cycling, car pooling, or walking. Where these options are practical, they should be considered. All of these options will avoid the need for the expensive SR22 insurance. While these choices will provide some options for those needing an SR22, they will not give drivers the option of being able to drive to and from their place of work, the shops… or anywhere. Therefore, the best solution remains to minimize the cost, by shopping around for the best priced insurance policy. Remember, Select Insurance Group focus on providing insurances for high-risk drivers, and will provide the best solution.